Alien Brad confuses a dog with a pony. Common mistake, right? As alien Brad finishes up showing off his knowledge of Earth animals, Miss Friday makes a joke about money business, and as you might expect, alien Brad takes the joke literally, and from his response you can start to tell that perhaps alien Brad might be a little lonely, being away from home. Miss Friday suddenly gets a message on her phone (in the middle of taping the contest question) and needs to find an excuse to get off the set to do something urgent, so alien Brad asks the question of the week. The reason Miss Friday has to leave right away is not explained in this episode, but is explained in the following one. This scene had a lot of lines for me to memorize, but it was filmed later in the week, and I was beginning to feel a bit more comfortable “acting” in front of a camera. 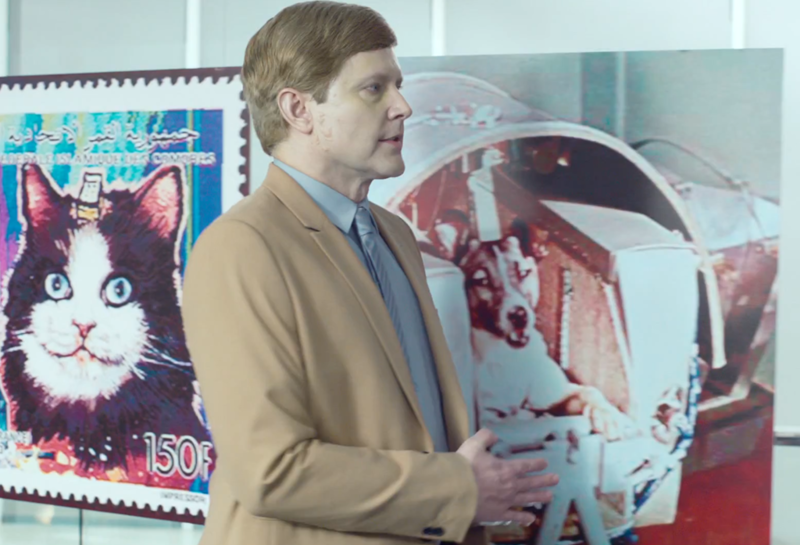 As I walked along the photos of the animals that have been sent to space, I goof up the last several as a joke. But at the last minute, Will, the director, decided that it would even be funnier if I changed a couple of the lines, and if they moved some of the photos around. Fortunately, the line changes weren’t too bad, and I was able to do them right away. In other cases during the shoot, when lines got changes shortly after I had memorized the older ones, forgetting the old lines and remembering the new ones was a serious challenge for me. We were able to get the first part of this scene in a couple of takes. Once all of the wide angle shots were done, then the camera was moved for close-up’s. The key close-up, and the biggest joke of the scene, was when Nell had to find an urgent excuse to leave. The key line was “I need to make it rain on Arrakis, if you get my meaning.” If you don’t get the sci-fi reference, it is referring to the planet from the book (and movie) Dune. Arrakis is a desert planet with no natural precipitation, so raining on Arrakis would be something that would be out of character for Dune, but in the case of this script, refers to Miss Friday needing to find any excuse to get away from the camera, as she has some urgent “business” to do. The nature of Miss Friday’s business is left up to your imagination, but she acts as if she is in great discomfort. I think Nell had too much fun with her Arrakis scene. She did a lot of takes, improvising differently in each one. This was a fun scene to watch Nell perform, per her usual self, she decided to improvise this scene a lot, with some takes showing only minor discomfort, while other takes she had excessive discomfort. In fact, as she is moving away from the camera, you can hear her saying something about “spice”. She adlibbed this line, which was another Dune reference, as Dune was a planet where spice could be found, which was the greatest treasure of the universe. Of course, spice, on Earth, can lead to other discomforts, as you probably can imagine. Nell is a huge sci-fi fan, even much bigger than me. I thought I was a sci-fi nerd, but she easily out-nerds me every time when it comes to sci-fi. Don’t tell anyone, but Nell likes to hang out at Comic-Con when she can. This is the first episode where boils are added to enhance my appearance. In the previous episodes, you may have noticed that alien Brad’s skin tone was changing some, and in this episode, boils begin to appear on his skin. What are these boils and what do they mean? As you probably know, while alien Brad is becoming more human-like in his social skills (well, sort of), his human body begins to reject his alien presence. As future episodes occur, you will notice that his human body deteriorates more and more. Eve, out makeup artist, did most of the makeup for me. 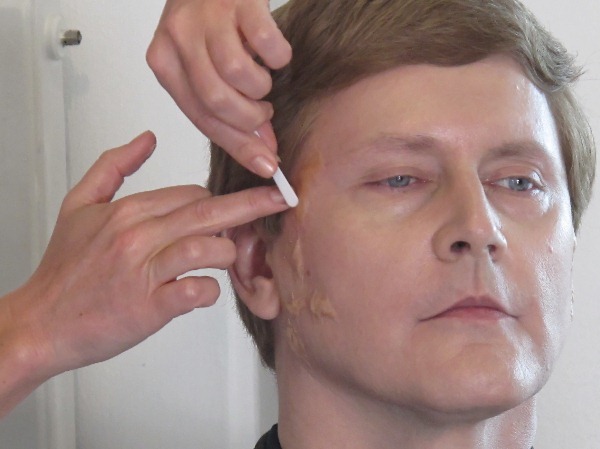 Fortunately, the makeup used for the boils was easy to apply and take off. For the most part, after it was applied, I forgot I was even wearing it. Actually, the worst makeup I wore was the base makeup that was used in every scene. At the end of the day it would be removed by the makeup artist. But once I went back to the hotel, I had to scrub my face four or more times to get it all off. In the next installment, I talk about episode eight.